My little guy, Joey, has an iron will. As a stay-at-home parent, I devote a good portion of my day to praying and prodding this little boy’s heart in the right direction. I do have to admit, he comes by his hard head honestly, as both sides of the family can tell legendary tales of stubbornness. And so, that is the neverending challenge in the Brokaw home (for all ages) – channeling our iron wills into the things that matter to God. In I Samuel 19, Saul’s iron will is channeled disastrously. Having openly declared his intention to kill David, Saul seems temporarily swayed by his son Jonathan (Verses 4-6). And after another successful campaign against the Philistines, David cautiously returns to Saul’s court with harp in hand. But as he plays for the fitful king, a javelin is suddenly hurled in his direction, making it crystal clear that David is no longer safe within Saul’s striking distance (Verses 8-10). That same night, David is trapped in his own home, as Saul’s soldiers wait to carry out their orders to assassinate him. David’s wife and Saul’s daughter, Michal, holds the hitmen off, claiming that David is sick and planting a household idol in David’s bed as a decoy (Verses 11-16). Having escaped through a window, David now runs to Samuel for sanctuary in Ramah, where the man of God mentors a community of prophets (Verses 18-19). But nothing is sacred to Saul anymore, and he now sends men to Samuel’s location to murder David. God intervenes, and three times in a row, Saul’s plans are thwarted by praise. Each time the men approach Ramah, they are overcome by the praise and prayers of the prophets, and overtaken by the Holy Spirit, they become a part of the worship service. As a result, David is untouched, and Saul finally decides that he has to do his own dirty work (Verses 20-24). But as Saul approaches Ramah, he too is overwhelmed by the power of God in that place – so much so that he is completely humbled in God’s presence. He removes his kingly robes and lies on the ground for hours, unable to do anything but worship the Lord (Proverbs 21:1, Isaiah 45:18, Romans 14:11, Philippians 2:9-11). You see, God is staging an intervention with Saul (Isaiah 1:18, John 3:16-17, I Timothy 2:1-4, II Peter 3:9) – temporarily taking away Saul’s free will, holding him in the humbled state that cannot deny its own helplessness, that cannot deny the sovereign, unchallenged power of a holy God. It’s as if God is pinning him down, pleading with him to lay down his iron will and beg for mercy. Saul has lost his kingdom, but God is trying to save his soul. And God is letting him know that his willfulness will be his own undoing. Sadly, Saul’s hard heart ignores this divine intervention and refuses repentance. As soon as God releases Saul, he is on the warpath again. Unchanged by his encounter with God, Saul will turn on Jonathan next (I Samuel 20:32-33), and channeled for rebellion, Saul’s iron will eventually destroys Saul and all of his sons (I Samuel 15:23, 31:1-4). I have to ask the question: Is God trying to intervene with you today? Has your iron will been bent in a bad direction lately? 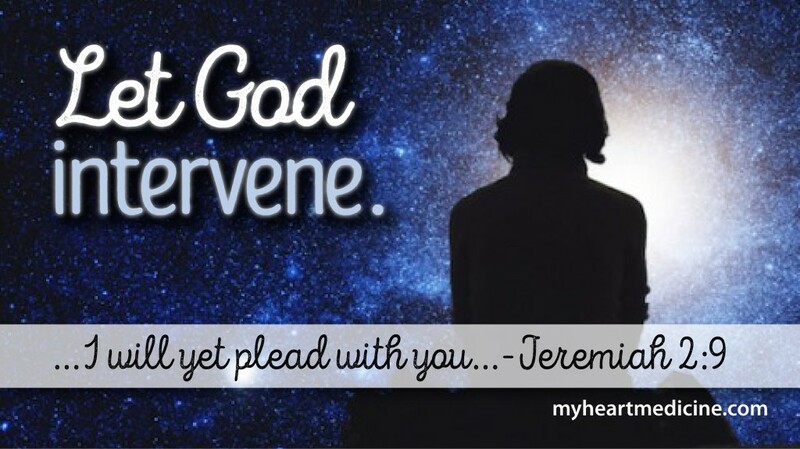 Is God pinning you down, turning up the heat, and trying to turn you in the direction that He desires? If so, I beg you – don’t waste that encounter. It is God’s life-saving, life-giving, longsuffering love in action. It may hurt now, but it will not let you stay the same – and one day you’ll be so much better for it. Let me plead with you. Let me pray for you. And let God’s divine intervention have its way in your heart. Let the Lord have His way. Ask God to show you the changes that He wants to make in your heart. Bend your iron will in His direction, and He will bless you for it.